This is awesome news. Thanks to both of you for pushing for this. Hopefully cgc follows suit without us having to specify cdn variants. Will this apply strictly to DC and Marvel price variants (I’m assuming your guide may be used for some sort of reference by them) or will it also pertain to Archie’s, Harvey’s and other smaller publishers that may exist? The knowledge and identification of all potential variants (cdn,aus, etc) needs to be expanded before this can be implemented with 100% certainty and accuracy. I’m still hunting books which most likely have cdn variants but have not been visually authenticated as such yet. A complete and thorough database needs to be created for all cdn and aus price variants regardless of publisher. There are hundreds if not thousands of issues between aus, Archie’s and Harvey’s alone that need to be catalogued before this can be a guaranteed success, otherwise CBCS may still end up NOT denoting the variant info on certain books. This is a great step in the right direction for these variants to be declares a permanent footnote in the history of comic collecting. Cheers. Great article as usual Ben, this news is huge ! Getting one of the two most prominent grading companies in the comic book industry acknowledging that these are truly ” Price Variants” on their labels is remarkable indeed. Congrats CBCS for doing the right thing and a special thanks to Tim Bildhauser for being the agent of change!!! This is great news ,and a game changer for me when it comes to collecting comics, this means that any key book that has a canadian price variant is now gonna be the sought out version \variant that I’m gonna be adding in my collection . Thanks CBCS for the label change . This is great news indeed!. A proper labeling by CBCS means more and more collectors will see these price variants for what they truly are in the hobby. I believe when books are properly identified for what they are then they will sell for what they truly are worth. 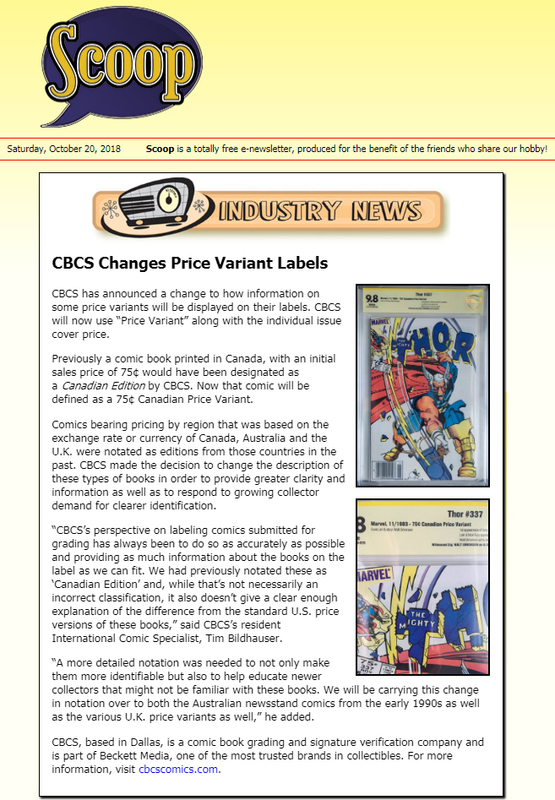 Three cheers to CBCS on a great improvement for price variant labeling. It’s about time. Great job on continuing to educate not only the public but the grading companies themselves. Type 1A price variants deserved so much better than to be saddled with that terrible Canadian Edition label. Canadian editions?Like the 40-50s foreign reprints? Confusing. Does CBCS ever plan on making a census available? Great article and great news for the hobby! Fantastic work by Angelo, Jon and Tim. Doug Sulipa, Jon McClure, Ben Nobel , Paul Clairmont and Bill Alexander have been educating the masses for years in regards to Type IA variants either through their market reports, blogs, etc… Without doubt, this news has validated all of their hard work and research! Congratulations gentlemen for everything you’ve done for the comic book collecting community !!! Finally music to my ears. This was long overdue, however it’s probably a good thing it took this long as I was able to pick up books during the wait. Congrats Ben on continuing to update us with your findings, and I look forward to reading more reports from you. CBCS deserves to be recognized for going against the grain, and this will give CGC a nice kick in the rear end to smarten up also. I have avoided getting my books graded because of previous labels, however this will now change my opinion. Congrats CBCS you have earned my business and my horn tooting moving forward. This is great news for anyone interested in first printing U.S. price variants. It’s really encouraging to see the grading companies stepping up to give exposure to these books and I commend all who worked to get us to this position. Again, great to see these books getting the attention they deserve and well done to CBCS for leading the way! This has been a long time coming! It’s just unfortunate that all this effort and persistence had to be made in the first place. Take a look at Ebay. I sell Canadian Newsstand Price Variants all the time. Who on eBay actually describes a CNPV as a “canadian edition”? Nobody. It’s a price variant and it’s described as such. The only exception we see are from those sellers who offer up Canadian Whites from the 1940s (this would make since considering they were actually made in Canada, hence a Canadian edition). So when your average Joe recognizes the differences and professionals don’t, then we have a major disconnect. Anyway, thank you CBCS for taking the lead on this and for all the hobbyists that took part in helping facilitate this change. Particularly you Ben! I have nothing against CGC but I’m very very very disappointed with them. Especially for a company as resourceful that they. But then again, it’s a classic example of business arrogance when you own the majority of the market and then become complacent to the needs to your customers. Business 101 will teach you that if don’t take care of your customers, someone else will. Good for you CBCS for recognizing this niche, it’s growing demand, and making the necessary investments to capitalize on it. From my perspective, your investment is not in vain. I have no doubt that everyone visiting this site, learning of the positive changes you’ve embraced, will be giving you their business moving forward. Again, thank you CBCS and to everyone involved. Definitely what we needed! These books are first edition US prints DISTRIBUTED to Canada, not printed there. One would think that distinction would be made in an announcement extolling more accurate information about CPVs. They seem to be missing the main point behind renaming these variants altogether. Hi everyone, I wanted to follow up on a few things — first, to James, good eye, that was indeed an error on the Scoop coverage of CBCS’s announcement and it should have read “distributed” not “printed” in that sentence to be correct… I pointed out the error to Tim; we should consider it just an error in the Scoop copy and not reflective of an error in CBCS’s understanding of our variants — rest assured Tim definitely understands our Type 1A’s are US-published variants, I say this both based on my own correspondences with Tim and also the content of the article he contributed to our 2019 guide [ https://rarecomics.wordpress.com/price-variants-and-the-international-collector/ ]. By the way, one thing I learned with our own Scoop coverage (of this year’s new price guide edition), is that they may edit the materials sent to them when creating their pages… and they did so in our case, in more than one spot. As an example, if you look at the 5th paragraph of our own Scoop coverage [ on this page: http://scoop.previewsworld.com/Home/4/1/73/1012?ArticleID=220562 ], i.e. the paragraph beginning “Canadian Newsstand Cover Price Variants were their bestselling variants, according to Sulipa. He went on to state …” — that was actually all re-worded by the Scoop editor(s) from a quote Doug gave… From the original materials we sent, readers would have understood that Doug was being quoted as talking about his own sales (i.e. at Doug Sulipa’s Comic World). But the way it was edited to become a paragraph of text and with the word “their”, I felt it might not be as clear to people. But any edits they made aside, we’re obviously still overall very happy we were featured in Scoop, and “the main thing” was communicated (people learned our new guide was release); and I imagine CBCS probably feels similarly about their own Scoop coverage (people learned they are changing their type 1A price variant labeling). As you can see from the above, lots of different variant prices are represented [I know some people upon hearing the initial news and seeing just the one 75¢ cover price example pictured were wondering how other variant price examples would look on the labels].